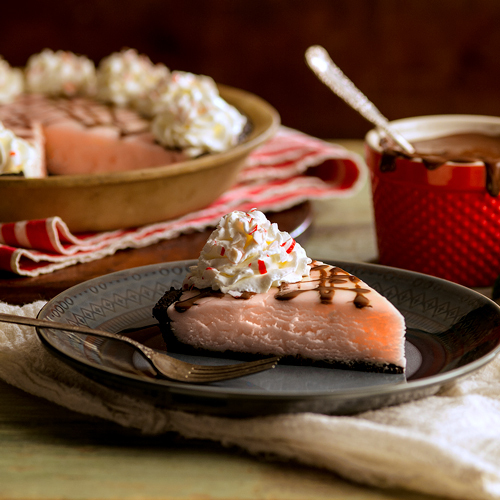 This creamy, minty, chocolaty ice cream pie is the perfect ending to a delicious holiday meal. Remove ice cream from freezer and leave to soften on counter about 15 minutes. Meanwhile, spray a 9-inch pie pan with cooking spray. Stir together cookie crumbs and melted butter in a medium bowl until blended. Place cookie mixture into the pie pan and press evenly over bottom and sides of the pan. Freeze for 10 minutes. Add Reddi-wip, ice cream, peppermint extract, and 10 peppermint candies into a blender container; blend until smooth. Pour filling into pie crust. Freeze for at least 3 hours. Crush remaining candies. Immediately before serving, top pie with chocolate topping, additional Reddi-wip and crushed peppermint candies.